Donations may be made using Visa, Discover, or MasterCard. All donations are handled securely and confidentially. Please read the complete directions on this page, to ensure your donation is properly credited to the University Center for International Studies, Finnish Nationality Classroom! Visit www.giveto.pitt.edu, click on the text: , and then select 'donate online now'. Fill-out the first page of this form and continue to the second page. 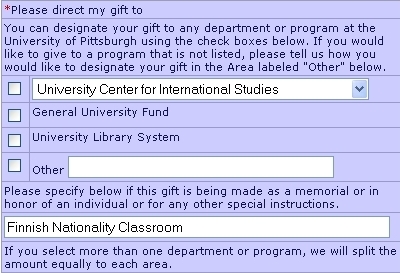 On the second page of the form (shown) below, direct your gift to the University Center for International Studies using the pull down menu next to the first check box. Click the check box next to this pulldown menu. Make sure to also include the following special instructions: "Finnish Nationality Classroom" as shown below or "Finnish Room Committee". Continue filling-out the online forms to complete the donation process. Thank you for your interest and support of the Finnish Nationality Classroom!